Aurelian became emperor in 270, and is remembered as one of the “soldier-emperors” who restored the empire after its near collapse. During his five-year reign, Aurelian re-united the empire after two-thirds of the provinces had broken away from central control. 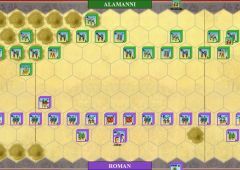 But first, Aurelian had to repulse a number of barbarian invasions. 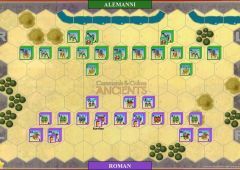 The most serious threat was posed by the Alemanni, a Germanic tribe that had made frequent incursions into Roman territory. 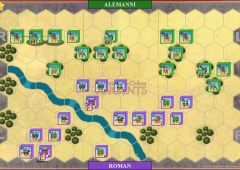 In 271 AD, after Aurelian had moved several of the western legions east to fight the Vandals and Goths, the Alemanni broke through the frontier forces and invaded Italia. 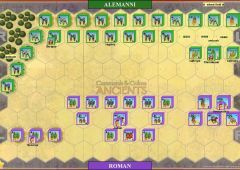 The Alemanni horde first sacked the city of Placentia in northern Italia. Emperor Aurelian, who was in Pannonia (near present day Hungary) with an army to control the Vandals, had to move quickly back to Italia. 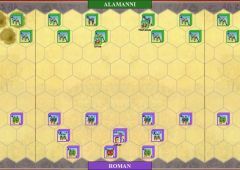 The Alamanni learned of Aurelian’s approach and set an ambush for the Roman Emperor. They achieved complete surprise and defeated the Romans. 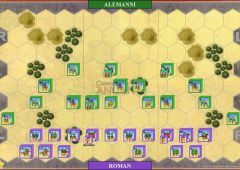 The Alemanni continued their advance towards the capital, which produced great fear and panic in Rome. Imperial Legions rule is in effect for the Romans. The river is only passable at the three river fords.